Ho Ho Chipotle, Santa! Jac’s Tailgaters $3.50 Black Friday Weekend Sale! 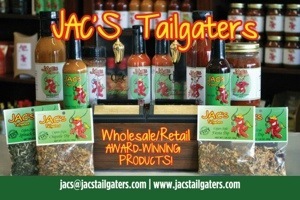 Now if you know me, you know I love me some Jac’s Tailgaters sauces, rubs, and mixes. So when Tracy Carter, aka JAC’s himself, asked me to help get the word out about his Black Friday thru Cyber Monday sale, I was all over it! So I asked him for the detail and he replied, saying……..wait for it………..it’s coming………and I’m not lying………honest….. EVERYTHING ON THE JAC’S TAILGATERS WEBSITE IS $3.50 EACH FROM BLACK FRIDAY THROUGH CYBER MONDAY!! EVERYTHING!!!!! That means Cajun Garlic Essence, Fling On Spice blend, Bayou Gold Mustard, my favs Raspberry Chipotle and Pineapple Orange Habanero…….everything is only $3.50 each (plus a nominal shipping fee per shipment)!!!! What a deal! What a steal! What a Ho! Ho! Ho! Holiday Spectacular! So not only is it a Fiery World, Virginia, it’s a great day to experience your after Thanksgiving turkey and dressing sandwiches with Jac’s Raspberry Chipotle or Pineapple Orange Habanero sauce! Or either sauce on vanilla ice cream (just trust me on this one….they’re great on both… honest-would I lie to you?!). How about adding some Cajun Garlic Essence to your Christmas party marinara dip, or whipping up a quick and easy 30 minute pot of chili or gumbo with Jac’s Bayou Chili or Gumbo mixes!? Such a deal! Such flavor! Such variety! Everything on their site for $3.50 a bottle, bag, or, shaker! So stock up on Bayou Gold Mustard, Bayou Blaze BBQ Sauce, Fling On, Q-Rub, or any one of the excellent lineup of products from Jac’s Tailgaters! Just click the link and get started!!! And don’t forget to tell them, Ladies and Gentlemen, that It’s a Fiery World! 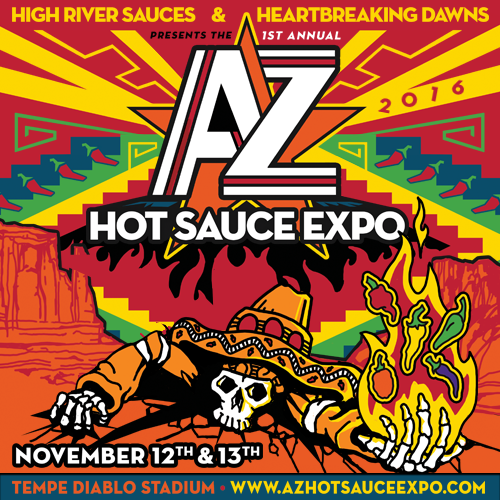 Puckerbutt Pepper Co. Sells Sauce for Charity! 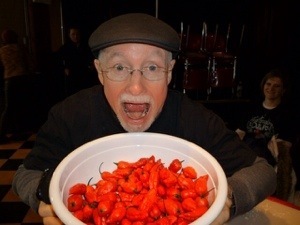 At the Houston Hot sauce show, Ed Currie, CEO of Puckerbutt Pepper Company had a bunch of people sign a case of I Dare You Stupit sauce to raise money for the Snowdrop Foundation, the Houston Hot Sauce Festival’s charity of choice, and the beneficiary of the festival’s profits. 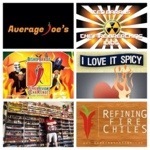 In addition to Ed Currie, some big names signed the bottles, including John “CaJohn” Hard, CEO of CaJohn’s; Chef Vic Clinco, World Renowned Hot Sauce collector; James Wreck, CEO of iBurn Hot Sauce store in Houston, TX; Tim Bader, CEO of Volcanic Peppers; Jim Duffy, CEO of Refining Fire Chiles CEO; and Al “Buddah” Goldenberg, who runs the long standing fiery food blog “I Love it Spicy”, along with ILIS reviewer Fiber Joe Madrid. Also signing the bottles were Fiery Food You Tube sensations Ted Barrus, aka the Fire Breathing Idiot; Brad Bishop, aka Bishop Brad/Pepper Lucha; and Brannon Deobolt, aka Average Joe. How much would you pay for that ? So, Ladies and Gentlemen, How much would you pay for a bottle of I Dare You Stupit knowing that ALL the proceeds will go to the Snowdrop Foundation for cancer patients. According to Currie, the bottles are being sold on Ebay with Puckerbuttpeppercompany as the seller. If you have an interest in one of these bottles for your collection, please click the link below! The folks at Snowdrop will thank you. And especially the many patients who benefit from the Snowdrop Foundation, and your generosity. Thanks in advance, Ladies and Gentlemen! And always remember that yes, Virginia, It is a Fiery World! Fueling Fitness with Fiery Food – Pass the Peppers, Please! Those of you that know me know that in the last year and a half, I’ve become extremely health and fitness minded – I lost 100 pounds, started exercising, and have basically re-tooled my life. I look better, feel better, have a better attitude, and have more confidence. How cool is that?! And having the obsessively addictive personality that I have, I channel a ton of energy into whatever and wherever I’m focusing my attention. So it stands to reason that I would work to combine my life of all things hot, fiery, and spicy into my new healthy, fitness focused lifestyle. Now Don’t get me wrong, ladies and gentlemen – I LOVE to eat! I LOVE food! You don’t live in South Louisiana as long as I have (most of my adult life, which is quite a while, at this point!) without developing a love affair with full-flavored, richly spiced cuisine. 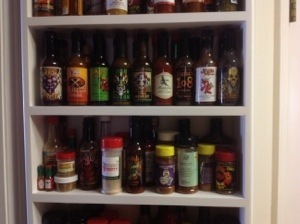 So when I went on “the diet” as I call it now, it derailed my standard approach to reviewing hot sauce and fiery food. I honestly started wondering if the two could co-exist. What an idget! Not only did I discover that they co-exist, they are almost joined at the hip, two peas in a pod, PB & J, Ricky and Lucy, Watson and Crick…..okay, I know…….you get it! Diet proponents have long espoused that food should be about flavor, not calories and fat. And that by flavoring what we eat with the spices (and heat) we enjoy serves to enhance our tastes, our experience, and our overall enjoyment of the culinary experience. And to top all that off, research shows us that eating a diet rich in spice and heat boost our metabolism, and some studies have even linked a diet full of sweat-inducing, nose running, hot peppers (pick a pepper, any pepper jalapeño hot or hotter) with improved gastrointestinal health!!! Plus, those wonderful, hot little buggars are chock a block full of vitamins, minerals, and anti-oxidants. I didn’t put any formal links to studies, cause this is more of an op ed piece, and Google is your friend, so my musings are easy to research and validate. So don’t be shy! Spice it up! Whip out that Captain Thom’s Thai Monkey on your stir fry, CaJohn’s Oaxacan on that veggie omelet, High River Sauces Grapes of Wrath on your salad, Jac’s Tailgaters Raspberry and Chipotle on your ‘nilla ice cream, Volcanic Peppers Hot Onion & Garlic Powder on….anything! And pick from among a virtual cornucopia of hot sauces, powders, and spices for that next whole wheat thin crust pizza with veggies and Canadian bacon (I may be cravin’ that one just a little….ya think?!) Your culinary well being will thank you…your metabolism will thank you….and your overall health and fitness will thank you! And why is that, you ask? Because, Ladies and Gentlemen, It’s a Fiery World!